We are committed to making sure that the healthcare we provide meets the needs of every person across the Fylde Coast. To do that, we need to work in partnership and to talk with – and more importantly, listen to – our patients, the wider public and the other organisations that are involved in health. Both the Fylde Coast CCGs are part of Healthier Lancashire and South Cumbria a partnership of organisations working together to improve services and help the 1.7 million people in Lancashire and South Cumbria live longer, healthier lives. It is often referred to as an Integrated Care System. The partnership is made up of NHS, Local Authority, Public Sector and voluntary and community organisations coming together to improve outcomes and care for local people, reduce pressures on services and make the best use of our financial resources. Find out more about Healthier Lancashire and South Cumbria. The CCGs sit on a joint committee of CCGs as part of this partnership working. Find out more about this meeting held in public here. 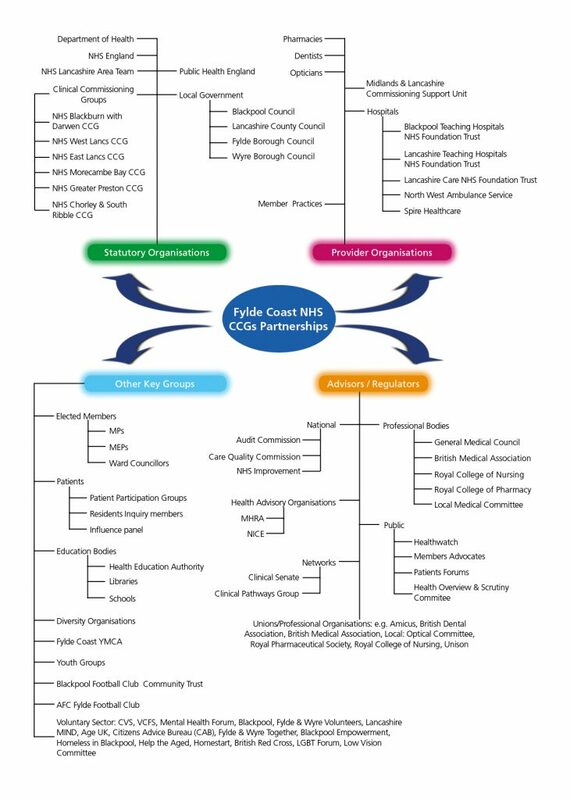 On a more local level, the two Fylde Coast CCGs are also part of Healthier Fylde Coast which is an Integrated Care Partnership consisting of the local authorities and health providers. The partnership deals with a coordinated approach to health services across Blackpool, Fylde and Wyre areas. Find out more about the Healthier Fylde Coast partnership. As well as working within these formalised partnerships to make the best use of resources and to plan for the future on a strategic level we also work closely with other groups. These partnerships help inform our work and co-produce services if at all possible. The below image maps some of the people we work with on a regular basis.